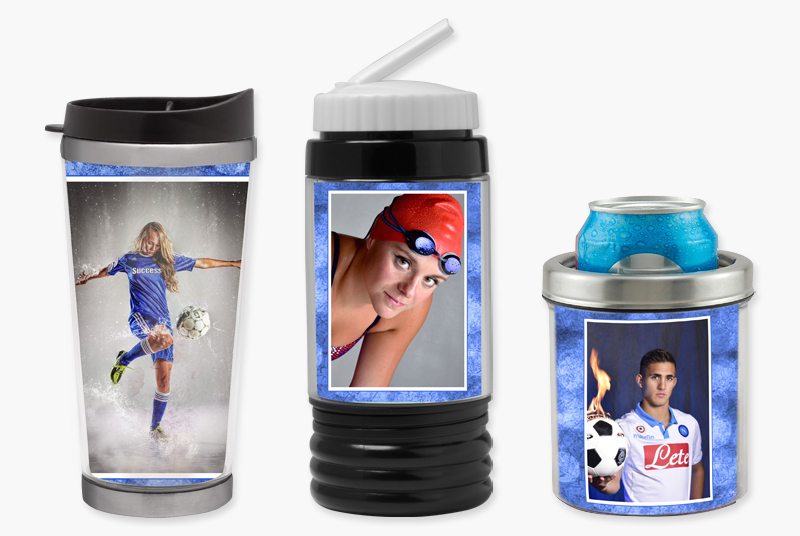 Personalize stainless steel travel mugs, plastic sports water bottles, and stainless steel beverage coolers with special photos for a useful specialty item that is a unique gift giving idea. Stainless Steel Travel Mug is a 12 oz. mug with image inserted into the mug itself. Perfect for hot or cold beverages, not microwave or dishwasher safe. Plastic Sports Bottle (water bottles) are a 15 oz. bottle that’s perfect for on-the-go snacks. Top portion holds water or favorite sports drink. Bottom unscrews to hold a healthy snack. Includes everlasting straw. Stainless Steel Beverage Coolers are personalized with your favorite photo. This cooler holds a standard size 12 oz. can or bottle.